For a short but robust summary of the ways in which literary studies have been informed by evolutionary theory, have a look at Joseph Carroll’s chapter, “Evolutionary approaches to literature and drama” in The Oxford Handbook of Evolutionary Psychology (2007) , edited by R.I.M. Dunbar and Louise Barrett. The chapter defines adaptationist literary scholarship as that which assumes that the human mind has evolved to meet the demands of its environment, producing species-typical behaviors, the needs of which literary works in part fulfill. The description of the orthogonal relationship between postmodernism and adaptationism, as well as the nuances in the debate between the adaptationists and the cultural relativists, are impressive given the length of the chapter. Readers learn of how literature enhances knowledge acquisition (e.g., concerning the environment and kin relations), and the literary contribution to the cognitive and emotional mechanisms that keep humans alive (attention, social bonds, perspective-taking, rehearsing adaptive scenarios, among others). Research in the evolutionary bases of genre in emotion, status, and reproductive success is reviewed, as well as current work concerning how a notion of universal human experience engages theories of literary merit. A real strength of this chapter lies, I think, in its rich overview of studies of specific literary works through the evolutionary theoretical lens: current adaptationist work in folk and fairy tales, epics, Shakespeare, lyric poetry, and nineteenth and twentieth century narrative fiction is surveyed. Those wishing to discover “what’s not been done” will enjoy the detailed last section. In eight pages of text, accompanied by 130 references, Carroll provides a not-to-be-missed introduction for those new to the area. Carroll, Joseph. (2007). Evolutionary approaches to literature and drama. In R. I. M. Dunbar and L. Barrett (Eds.) 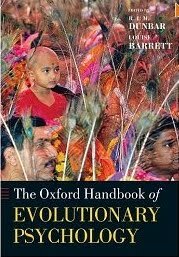 The Oxford handbook of evolutionary psychology, pp. 637-648. New York: Oxford University Press.